Women's football has been given a boost with the Chinese Football Association's new policy that mandates a women's team at every club in the Chinese Super League. According to CFA’s new regulations introduced earlier this month, all CSL clubs must have their own women’s teams from the 2020 season. Women’s football has been given a boost with the Chinese Football Association’s new policy that mandates a women’s team at every club in the Chinese Super League. The women’s team must be playing in one of the three tiers of women’s football leagues in China. Training facilities and living costs must be covered. If the women’s team plays in the top-tier Women’s Super League, the club’s yearly investment to the women’s team should be between 15 million (US$2.2 million) and 30 million yuan. In the 2019 season, it will remain optional whether a club has a women’s team. But starting from next year, it will become a threshold for clubs wishing to participate in the top-tier league. The policy is aimed at boosting the development of women’s football, which has not enjoyed the resources and attention afforded to the men’s game. 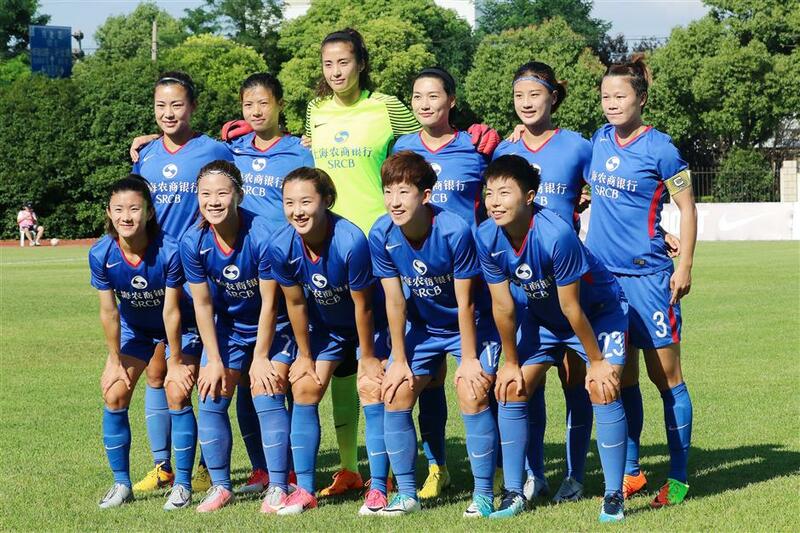 As most CSL clubs don’t have women’s teams, approaching existing women’s clubs, including university teams, would be the easiest solution if the clubs find it difficult to build up their own women’s teams in such a short time. Shanghai SRCB is among the eight teams in the top-tier Chinese Women’s Super League. The second-tier Chinese Women’s League One also has eight teams. For cities that have two CSL clubs, including Shanghai, Guangzhou, Beijing and Tianjin, women’s teams in higher tier leagues might become a target to contend for. “It’s a policy that has long been discussed, and I’m happy that it will finally take place,” said Liu Jieru, captain of Shanghai SRCB. Asked whether the club had been approached by any of the two Shanghai CSL sides — SIPG and Greenland Shenhua, Liu said it would likely be a decision for the city’s football authority to make, though the opinions of Shanghai SRCB players would also be collected. “For me, the club that treats us more seriously would become my favored choice,” Liu told Shanghai Daily. “I don’t want a men’s club to consider it as an obligation, but to have the real intention to help a women’s team grow. The team has been a traditional powerhouse, winning four top-tier league titles in the past decade. They are also the champions of the 2017 National Games. The club encountered some financial difficulties in 2017. But with Shanghai Rural Commercial Bank becoming the club’s major sponsor from the 2018 season, the situation is expected to be improved. The four-year contract is bringing the club a reported 20 million yuan investment every year. According to the 28-year-old Liu, Shanghai SRCB is a young team with an average age of 21. It’s also a team with great potential, as over 10 players are in the national teams — six in the women’s national team, four in the reserve team, and two in the national youth team. Led by former national player Shui Qingxia, Shanghai was playing with an all-Chinese squad in 2018, but plans to introduce a few foreign players in the new season. The only other Women’s Super League team that didn’t have any foreign players in the past season was Hebei, which got relegated. Shui has been coaching Shanghai women’s teams since 2009 and she has great expectations of the new policy. Just as in men’s football, investment has a major impact on a team’s performance. Dalian Quanjian is a typical example. It has dominated the women’s Super League in the past three years. According to Liu, the yearly investment Dalian receives has been no less than 50 million yuan. Its regular startup players are receiving an annual salary of over 1 million yuan. “It’s obvious that more investment will make the operation of a team more professional, including the expansion of the market and fan base,” said Liu,. However, she is not very happy with the 30 million yuan investment cap in the new policy. “While investment into men’s teams is counted in hundreds of millions yuan, 30 million is a bit shabby. We should be of higher value,” said Liu, who also believes that building connections with CSL clubs will attract more attention from society for the women’s team. Shanghai SRCB was using Shanghai University’s stadium as their home ground in 2018. The venue has a capacity of 400. But in 2016, when the team was allowed to use Hongkou Football Stadium with the football authority’s support, attendances could reach 2,000. “We have loyal supporters, including foreigners who have the habit of bringing their families to a sports event during off days, but I hope the market can be further explored, and more online and offline interactions with fans can be organized,” said Liu. Describing her current income as “acceptable,” Liu hopes the new policy and investment will bring players a higher income and more attention from the public. “Maybe we can reach cooperation with colleges and universities and help players arrange their life and career after retirement, which has been a big concern for parents when they send their children to football clubs for professional training,” said Liu. The 2019 Chinese Women’s Super League won’t kick off before the second half of the year to make way for the 2019 Women’s World Cup. Liu revealed that Shanghai SRCB is contacting sports venues, including Pudong’s Yuanshen Stadium and Jinshan Stadium in Jinshan District, before deciding on a new home ground. The team is currently in Japan for a two-week winter training session as well as friendly matches with local teams. “We are setting a goal of a top-three finish in the 2019 Super League, and even fight for the championship if the team can have a smooth season,” said Liu.